Once the drummer for Nirvana, now the singer/guitarist for the Foo Fighters and representative for the current state of rock. 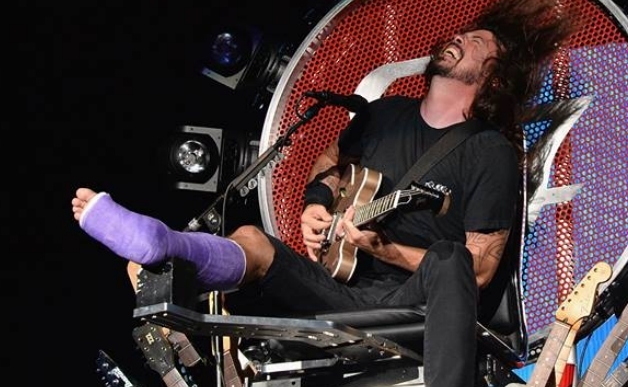 At a recent July 4th show, Grohl displayed his, “show must go on” attitude by appearing on a custom-made chair that allowed for rocking while keeping the rehabilitation for his broken leg intact. “I’m not missing this show for the world.” the Foo Fighters frontman stated during the band’s performance at Washington, D.C.’s RFK Stadium. Grohl had been recuperating from a broken leg he suffered from falling off the stage at a show earlier this year, but refused to cancel this 4th of July gig. The date marks the 20th anniversary of their first album, plus the show was near an area of Washington where the rocker spent his youth. Admitting he was high on Oxy for pain, Grohl sketched out the design for a throne that would be the envy of Westeros. The show’s set featured a film of the accident, along with shots from Grohl’s hospital and the designing of the chair.